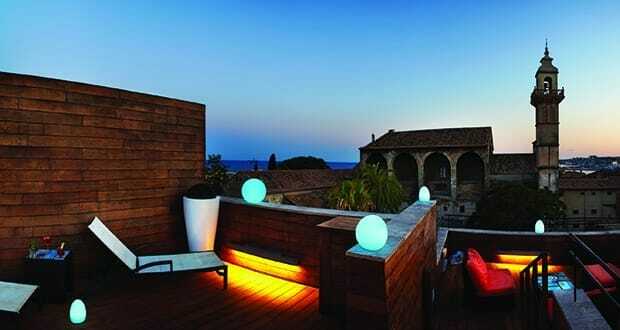 Located in the old town of Palma, Santa Clara is a modern boutique hotel and spa surrounded by history. The location means you have an abundance of designer shops, cultural points of interest, and tourist attractions all within a short walk. With so much to see and do in Palma, somewhere to relax after a day on your feet is always welcome. The spa at Santa Clara offers the perfect place to recover from a day spent sightseeing. They can provide a substantial range of beauty treatments and massage therapies, as well as offering a sauna, hot tub, steam shower, and an orange-scented multi-jet. Or you could take the easy option and simply curl up with a good book in one of their hammocks. The rooms vary from standard doubles to duplex suites. All the rooms and suites have period features, such as exposed stonework and beams, and are decorated to feel bright and airy. They incorporate all the technology you could need, including a very welcome multimedia dock. We Love …. Sipping cocktails on the rooftop terrace. Why you should stay here…. For the excellent service in a prime location. For a very small charge the hotel will hire you a bike to help you explore Palma and enjoy the full length of the seafront. We hope you have found this article about the Santa Clara Hotel Palma de Mallorca useful and that you have many memorable stays in Mallorca as a result of our recommendations.